PASCAGOULA, Miss., July 20, 2009 -- As dozens of invited guests and shipbuilders gathered, Northrop Grumman Corporation (NYSE:NOC) honored the memory of a Coast Guard pioneer by hosting a keel laying ceremony for the U.S. Coast Guard National Security Cutter Stratton (WMSL 752) here today. Stratton is named in honor of Dorothy C. Stratton (1899-2006), the U.S. Coast Guard's first female commissioned officer and director of the SPARS, the United States Coast Guard Women's Reserve, during World War II. First Lady Michelle Obama has been designated as the ship's sponsor. 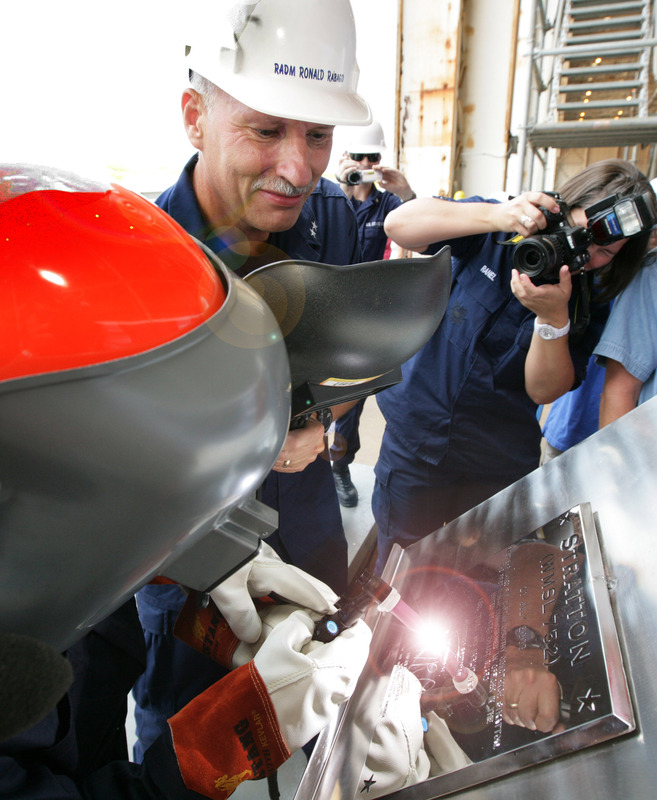 "I am honored to serve as the ship's sponsor of the United States Coast Guard cutter Stratton," Mrs. Obama wrote in a letter read by U.S. Coast Guard Rear Adm. Ronald J. Rabago, assistant commandant for Acquisition and Chief Acquisition Officer (CAO), during the keel laying ceremony. "I'm especially pleased that the cutter's namesake is Capt. Dorothy Stratton, a pioneer in our nation's military history. She is a source of inspiration for countless women in uniform and for young women and girls who may one day serve in our nation's armed forces." "It's a great day to be a shipbuilder," said Irwin F. Edenzon, vice president and general manager of Northrop Grumman Shipbuilding-Gulf Coast. "We're honored the First Lady has agreed to be the sponsor of this great ship and we welcome her as part of our shipbuilding family." Stratton is the third of eight National Security Cutters that comprise the Legend class, the most technologically sophisticated class of ship in the history of the Coast Guard. With its 418-foot length and 4,300 ton full load displacement, the NSC is the largest of the new multi-mission cutters. "We are all pleased and impressed with the dedication of the men and women of the Coast Guard's Gulf Coast Project Resident Office and of the Pascagoula shipyard," said Rear Adm.. Rabago. "Their commitment to excellence in producing the National Security Cutter class to meet the demands for Coast Guard missions is truly inspiring. These eight cutters can't come soon enough, as they will be replacing a very old 378-foot Endurance-class cutters, which have been in service since the 1960s." The first NSC, USCGC Bertholf (WMSL 750), has been commissioned and recently accomplished its first drug interdiction off of the coast of Guatemala. The second ship, Waesche (WMSL 751) is still under construction. Powered by a twin propeller combined diesel and gas turbine power propulsion plant, the NSC is designed to travel at 29 knots maximum speed. The cutter includes an aft launch and recovery area for two rigid hull inflatable boats, a flight deck to accommodate a range of manned and unmanned rotary wing aircrafts, and state-of-the-art command and control electronics.